The Britax Evolva Car Seat Group 1-2-3 in Cosmos Black adapts to your child’s needs from 9 to 36kg. Keep your child safe as they grow with this comfortable and secure group 1-2-3 car seat that transforms easily from 5-point harness seat to high back booster. This clever forward facing car seat will keep your little one safe for years to come. The soft cushioned sides and headrest are designed for both comfort and protection. The deep, softly padded side wings offer the ultimate in side impact protection, guarding your little one’s head and neck like a protective cocoon. Multi-position recline allows kids to relax in comfort, so everyone can have an easier journey. Keep your little one secure with the easy to use 5-point harness, featuring smooth one-pull adjustment and suitable up to 18kg. Simply stow it away when your child is old enough to use the vehicle’s 3- point seat belt, for an easy transition from harness seat to high back booster. Seat belt guides correctly position the-point seat belt over the child's shoulder and pelvis, so you can be confident in your little one’s safety. The headrest height and harness can be adjusted with one hand, so it’s easy to adapt the Britax Evolva Car Seat Group 1-2-3 in Cosmos Black to fit your growing child. The easy to wash cover and the pull out drink holder and snack tray provide you and your child with added convenience. 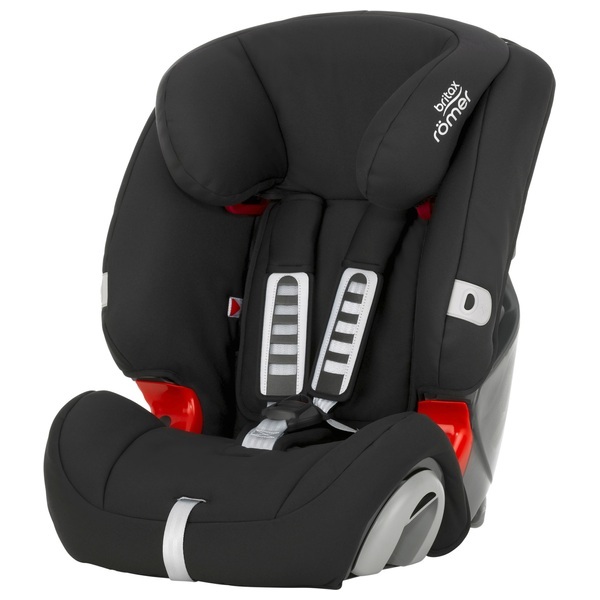 The Britax Evolva Car Seat Group 1-2-3 in Cosmos Black is easy to install using your vehicle’s 3-point seat belt.